Professors from St. Scholastica will engage middle-school students in science, technology, engineering and mathematics (STEM) subject matter next week. The Shoot for the Stars: Launching into Math & Science program is geared toward getting middle school students interested in STEM fields. This year, St. Scholastica will host 40 students on campus for the weeklong camp during the week of June 12. Participants are sixth-, seventh- and eighth-grade Lincoln Park Middle School students. Starting Monday, June 12, the camp will feature a week of science and math lessons and activities, with topics including rocket aerodynamics, and a variety of activities such as scavenger hunts, campus tours, and group bonding games. The camp will last from 8:30 a.m. to 3:30 p.m. each day, on the St. Scholastica campus. The project is a collaboration between St. Scholastica faculty and Lincoln Park Middle School principal Brenda Vatthauer, Community School Coordinator Rachel Thapa, and other LPMS staff members. The program is funded in large part by a grant from the Duluth YMCA with 21st Century Funds. School administrators report that in its inaugural run last year, the program succeeded in generating interest in additional STEM study and careers. Organizers exceeded their goal of 20 participants, and 88 percent of students who took part in Shoot for the Stars expressed interest in taking part in a STEM club. Sixty-two percent reported increased interest in STEM careers and fields. "One of last summer's participants told me that he wanted to go to college after being on campus and experiencing the program," Thapa said. "He had never been on a college campus before and did not know that there was one right in our community." Vatthauer said that several of the students had "come out of their shells" to become engaged leaders in their school. The camp will be followed by a math/science club during the academic year to cultivate long-term engagement and enthusiasm. Donna Kirk, a math instructor at St. Scholastica and co-director of the club, said the middle school years are a critical time to create student interest in STEM fields. Even if students do not end up pursuing math or science specifically, she said, the skill sets and problem-solving techniques that are strengthened through studying STEM topics can aid students in other academic areas. "This concept was developed with specific aims to address a STEM opportunity gap for local students during their critical middle school transitional years, helping them see these topics as fun, interesting, accessible, and applicable to their current lives and future education and employment," added program co-director Tim Trygstad, associate chemistry professor at St. Scholastica. Additional Shoot for the Stars partners/supporters include: Lloyd K. Johnson Foundation, Enbridge, Upward Bound, Advantage Emblem, and Aly Jean Photography. 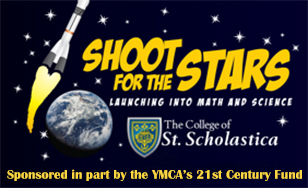 For further information, please contact Shoot for the Stars Director Donna Kirk at 218-723-6389 or dkirk@css.edu.